Many moons ago, as I was struggling through some Mendelssohn clarinet excerpts, I was given some sage advice in the form of a question. She said to me, “you know you can play the clarinet however you want, right?” I’ve thought about that a lot since that day. What she meant wasn’t that I could disregard technique – the clarinet only really works one way – air in one end… fingers over holes…etc. She was telling me that I didn’t need to spend hours doing things that I thought I needed to do… like obsessing over Mendelssohn excerpts. I’ve been fortunate to earn a living for nearly six years only by playing music. Part of that means playing stuff from time to time that I find shall we say… less than engaging. [I throw up a little in my mouth everytime i play a show that starts with Michael Buble’s version of feeling good.] This is why I think it’s important, indeed sometimes mission critical to carve out a chunk of your playing or musical existence that is just for you. [To play however you want] For me, this largely takes the form of solo soprano playing. I’ve always naturally gravitated toward the straight horn. I do very little commercial work with it. I play some jazz on it, but mainly it’s for me – I write and improvise in a very personal style on the soprano. I know that it’s probably too odd to get a record deal and probably not strange enough to please new music guys. That’s not the point. It’s for me, and it’s from the heart. That being said, I’d love to share it with you! The reason I’m writing this is because tomorrow night I’ll be playing exactly what I want. 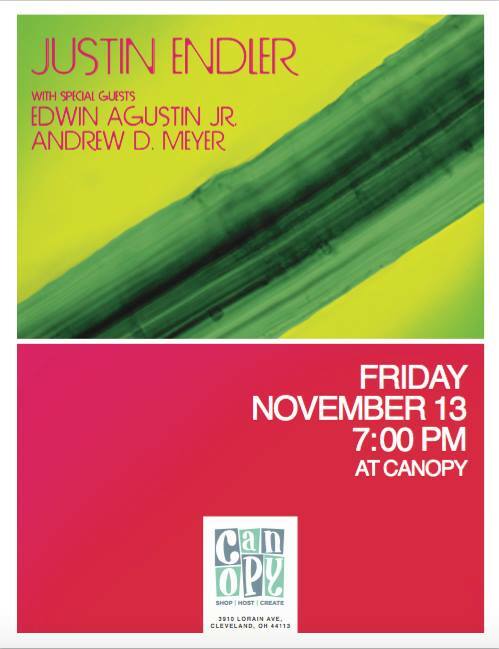 I’m kicking off a great night of music at Canopy on the West side of Cleveland by playing two solo soprano compositions. Both of these pieces were written in 2012 while I was living in Oslo, Norway. While largely composed, they both have sections of improvisation. First on the bill is a piece called Most Magical Night. This piece is sort of an homage to one of my favorite composers, Terry Riley. Mainly composed of reapeated rhythmic figures, this piece can vary in length based on how many times each figure is repeated. The inspiration for this work [how self-important does that sound!?!?] came while I was walking in the Nydalen neighborhood of Oslo one night as a storm was developing. I’ve always found that there is a sort of magical energy in the air when a storm is imminent and without being programmatic about it I think this piece expresses the energy that I felt on that walk. The second piece it’s called Forever Bright. This performance will be two smaller sections from a suite that I’ve written based on a personal mantra. The mantra is how I am trying to approach life: Quiet, Calm, Forever Bright, and Vibrantly Alive. This performance will feature the intro section to the suite and the Vibrantly Alive movement. This piece also contains repeated, minimalist ideas but also much more emotive, lyrical content. I’m really looking forward to it and I hope to see you there! I’m starting at 7 so don’t be late!